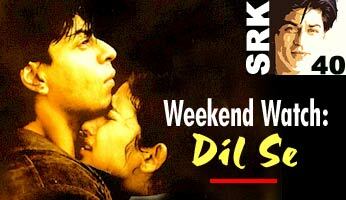 As Shah Rukh Khan turns 40 on November 2, we at rediff.com decided to look back and recommend some of his best films�to you on DVD, as part of�our regular Weekend Watch feature. Please write in if you'd like to recommend any particular SRK classic. The film opens on a deserted railway station, at night. Shah Rukh Khan, sans glitz of any kind, rubs his arms briskly to keep warm from the cold and the rain. His Amar looks ebullient, slightly amused, slightly apprehensive�-- visibly not local to the surroundings. He sees an ambiguous shape wrapped in a dark shawl huddled on a bench, and he needs to make conversation. He goes up to the shape, and asks for matches even as he exasperatedly looks at his wet, wilting cigarette. His warm oyes of greeting soon fizzle out as the shawl eclipse passes, and he realises that the ravishingly beautiful woman sitting there is decidedly different from the old man he expected. Now, Amar Verma, like any self-respecting radio journalist, really wants to get things to a point of personal terra firma, to talk to her. To wax poetic and charm, sure, but also to get to know her, to try and just unravel this stunning lady in the middle of nowhere. The quaint surroundings just help in him getting completely carried away. Which movie would you recommend? After many attempts at ice-breaking, Meghna (Manisha Koirala) finally relents, and asks him for a hot cup of tea. He can't believe she spoke, she smiled. She repeats the request. Her self-appointed knight in red jacket scrambles away and frantically wills the chaiwallah to hurry up. The hot glasses reach his hands, but by then a train has pulled away, with her in it. He looks desperately behind it, raindrops plopping rhythmically in the chai,� knowing the inevitable�-- he's smitten. Sounds like the fairytale beginning to any Hindi film love story, but it's not. The enigmatic and coldly aloof Meghna isn't the traditional song-and-dance muse, a girl keeping well to herself and decidedly out of Amar's way. This infuriates the young All India Radio man, who makes it a mission to chase her. As the two are in northeastern India and Amar interviews militant leaders for a living, his amorous pursuit causes him much physical pain. But he dismisses this; he is a man obsessed. Meghna says she is married, and points cryptically to two (!) men. Amar is shattered, but perks up considerably when the goons in question accost him. 'Don't you dare look at our sister' threats are issued, but Amar � being kicked in the ribs � is just glad that she isn't married. Laceration is a small price to pay for love. The peculiar courtship continues, and cinematographer Santosh Sivan flexes visual muscle as they veer from the world's coldest lake to the inside of a monastery, and he's helped considerably by the ethereal, raw and undeniable beauty of his leading lady. As Meghna washes her face casually, we can see why Amar has flipped. As with most Mani Ratnam films, the plot isn't simply a love story. Dil Se is also about idealism and the birth of the terrorist -- simplified to a great extent, but neatly executed. Ratnam uses 'passion' as his keyword, exploring it on various (occasionally obvious) levels. His protagonist is a smart man, bewildered by the onset of great emotion, but well grounded in nationalistic fervour. The acting in the film is top-notch. Khan delivers a compelling performance, and the film is one of the first where he seems more Amar, the character, than SRK, ubiquitous superstar. He plays the part with taut restraint, and expresses exasperation superbly. The last quarter of the film sees it as a tense actioner, and it is here that Khan suddenly switches gears � for a while, this isn't SRK, it's Amitabh Bachchan from his grittiest seventies movies! While not mimicking the Big B, Shah Rukh manages to capture the now-trademark angry-young-man intensity with great �lan. Amar is a character you empathise with, except maybe you also end up having a teensy crush on debutante Preity Zinta, with whom he chomps burgers and blushes about virginity. Which is why you don't want to reason why he doesn't go for her, after all. Preity bounces irresistibly onto the scene, with a flurry of babble, and we're swept away. Manisha, of course,�handling the brunt of the film's most emotionally demanding histrionics, is flawless. Veterans Raghubir Yadav and Zohra Sehgal have adequate opportunities to steal scenes, and they oblige wonderfully. Gulzar crafts�sublime�lyrics, brought to life by A R Rahman's finest soundtrack, by far. The six songs are impeccable, brilliant, and come together magnificently. The entire feel of the film is appropriately poetic, with a few romantic exchanges standing out quite memorably. Tigmanshu Dhulia�has handled the film's�dialogues adroitly. Amid moonlit desert dunes, there is a particularly stirring conversation between the leading pair. In a�somewhat big-bad-wolf-ian moment, Amar reveals his love for Meghna's eyes -- because he can't see the world hidden behind them, and his hate for the same, stunning eyes -- because he can't see the world hidden behind them. This is Ratnam's third film in his terrorism trilogy, so to speak�-- after Roja and Bombay. While the first two were arguably more credible films, the director has certainly improved with each go, as a filmmaker. Dil Se is not as touching as Roja, or as intense as Bombay. It is, however, a better-made film, by a director using his craft to tell a rather stupendous love story.